Found it Cheaper? We'll Beat it! The X-GLOO Inflatable Event Tent is ideal for any company looking to maximise their brand potential at both indoor and outdoor exhibitions and corporate events. 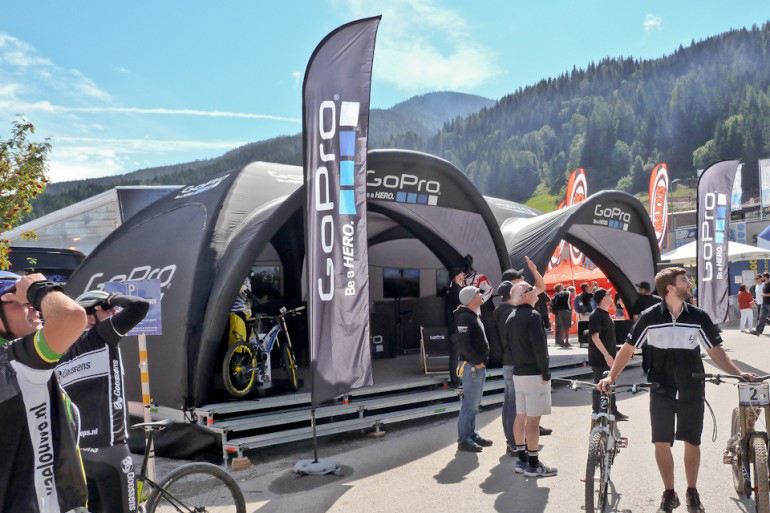 Designed with the iconic igloo shape in mind, the X-GLOO Event Tent range offers nearly limitless customisation options and brand potential whilst providing a sturdy promotional display solution. The X-GLOO can be inflated in just 5 minutes depending on the size and can be anchored to both soft and hard ground using a variety of different anchoring options we have available such as the water ballast barrels or the tube ballasts. Setting up the X-GLOO is as simple as unpacking the tent, inflating it with either the hand pump provided or an electric pump and then securing it to the ground. X-GLOO dome tents generate excitement and wonder at any event with its simple setup and futuristic design making it stand out against standard inflatable gazebos, marquees and stretch tents. As an official UK distributor of X-GLOO products, we are able to deliver the Inflatable Event tent worldwide. X-GLOO blow-up event tents are designed and constructed to be of the highest quality and functionality available. Our tents are perfect for use in most environments due to them being waterproof, fire retardant (B1 Certified), stable in winds up to 60km/h when properly tensioned and anchored and they also have an Ultraviolet Protection Factor (UPF) of over 50 to protect both your staff and visitors at sunny locations. Traditionally the X-GLOO has primarily been used as a short-term solution for trade shows or marketing events, however a long-term outdoor test proved that the X-GLOO tent can also easily stand up to tough weather conditions for extended periods of time. The X-GLOO has been tested to withstand and endure long-term use in all weather and provides exceptional shelter from harsh environments such as sand, snow, heat, cold, and can even be used on the water for events such as triathlons, boat races and other sporting activities. A 2 year warranty comes as standard with the X-GLOO event tent which covers the tent matrix, elements and all of the accessories. Additionally the tent matrix and elements also include a 6 month, free repair guarantee. The free repair guarantee does not extend to accessories such as pumps, backpacks and trolleys. Both the X-GLOO exhibition tent and components such as walls, canopies and tunnels feature a sleek and attractive design that have earned the event tent the prestigious Red Dot Design award. An LED Lighting Kit is available as an optional extra which allows you to showcase the X-GLOOs design and stand out among the crowd in low light environments such as evening parties or functions. The light is simple to transport and can be attached to the centre of the roof with a strap. 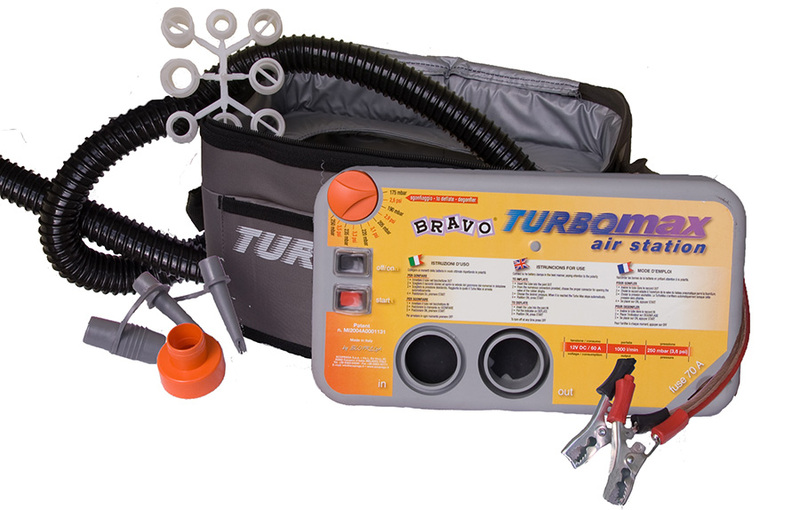 The cable can be hidden between the roof and the tubes for a more professional appearance. 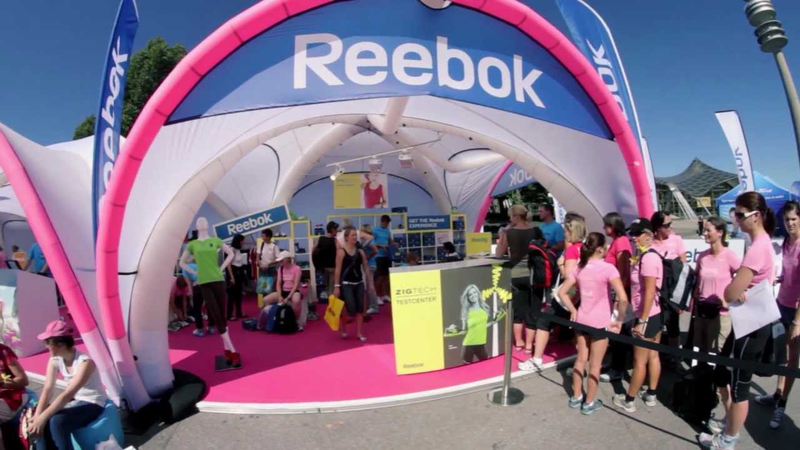 Almost all components of the event tent can be custom branded allowing you to turn the X-GLOO into an attention-grabbing marketing tool, branded with your colours and design. 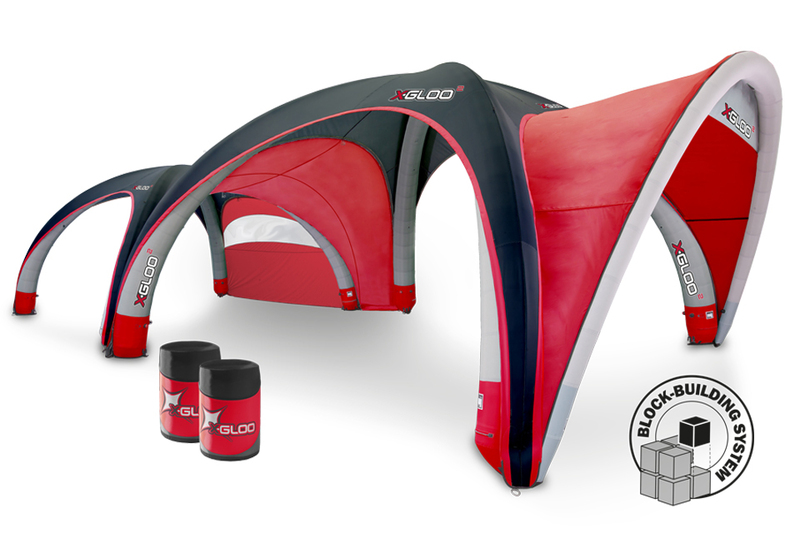 The X-GLOO inflatable structure is lightweight, weighing in at just 13.3kgs (approx.) for the 4x4 size. Thanks to the aerodynamic form, high-tech materials, and clever stabilisation system, it is perfectly suited for indoor and outdoor use. The tent reduces down into a surprisingly small backpack which comes as standard, this allows for easy transportation and storage. For the 8x8 Event tent the Aluminium Carry Case is required which helps to protect your event tent while your travelling. Thanks to the 4 tube design of the X-GLOO pump up tent and the location of the inflation valves, it can be set up in as little as 5 minutes by just one person, depending on the size of the tent. Once inflated the pump can be removed and the tent will stay standing for days on end, no permanent pump is required. A hand pump comes as standard however we offer the electric pump, the turbo electric pump and the 8x8 electric pump for even quicker set up times. In the unlikely event that your X-GLOO becomes damaged or punctured, the affected parts can easily be removed for repair. The legs of the X-GLOO are all separate and can be individually unclipped from the central anchoring point meaning the whole event tent won’t deflate if you get a puncture like other inflatable tents would. Walls, accessories and inner tubes can also be removed simply by unzipping them. To repair a puncture on an X-GLOO leg, unclip the damaged leg from the central anchoring point and deflate it. Once deflated you can un-zip and un-fasten the base of the leg to expose the bladder, the bladder can then be fully removed, allowing for easier repair. Repairing a puncture on the X-GLOO is as simple as repairing one on a bicycle. We also offer a free X-GLOO health check in your six months to ensure that your X-GLOO is in top condition for your next event. German designers Skywalk have invested thousands of hours towards engineering and testing different fabrics and prototypes to ensure that the X-GLOO is of the highest quality possible and stands up to the wind and weather efficiently. The X-GLOO has even been tested in a professional wind tunnel to make sure that it can maintain stability in winds up to 60km/h. At exhibitions getting your brand noticed is important, which is why the X-GLOO can be fully printed with your logo, text, and images. The X-GLOO tent matrix and our components such as walls, tunnels and canopies can either be unbranded with a range of 7 standard colours or fully printed. The seven standard colours for unbranded X-GLOOs include black, white, red, grey, blue, yellow and green. The branding options available allow you to stand out from the crowd at exhibitions and boost your marketing and promotional potential. X-GLOO tents are available in a range of sizes including: 4x4, 5x5, 6x6 and 8x8. The 4x4 tent provides 16sqm of floor space whilst the 8x8 large event tent provides an impressive 61.6sqm of floor space, plenty of room for brands to showcase their products. With this range of sizes plus the ability to connect multiple X-Gloo event tents together, you have the scalability options to suit any requirements. X-GLOO pop-up tents are available with a selection of different ‘Elements’ that are used to expand and build upon the tent matrix. Some of the elements include optional walls, window walls, canopies and linking tunnels to link multiple X-GLOO event tents together, even different sizes. The awning is also available with a banner at the top that can be fully branded and custom printed with your logos, text and artwork. The X-GLOO features high quality YKK zippers which means that double sided components can be fitted with either side facing outwards, allowing you to change your marketing message mid-event should you need to. The block building system allows you to grow your X-GLOO as your business grows by adding new components and even multiple X-GLOO event tents to create a tent city! 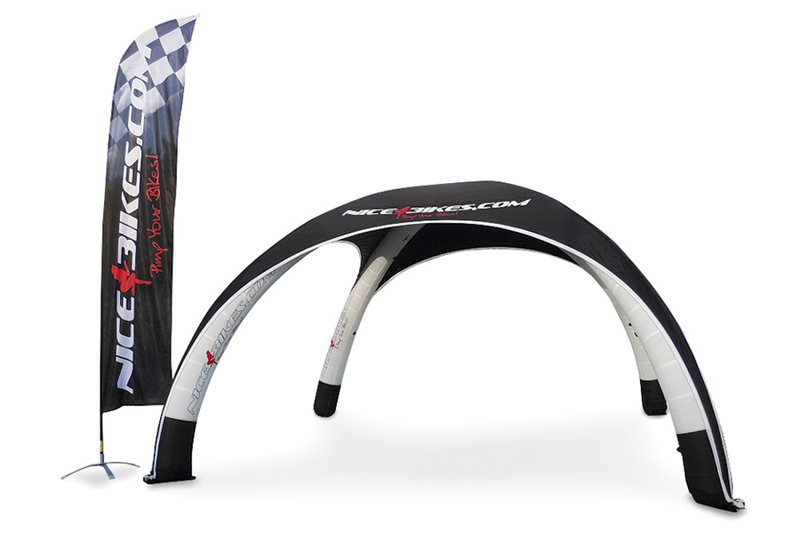 You can also easily change components for different marketing messages at exhibitions as they simply attach to the tent matrix using a zip. The roof and tubes which make up the tent matrix can also be removed and replaced with ease. The tubes can be removed individually allowing you to swap them out for different branding or repair them easily. Almost all of the elements can be custom printed with your artwork, text and logo’s allowing for maximum brand exposure during events. A range of printing techniques are available for the X-GLOO, catering to every budget and timeframe. Dye sublimation printing is an available option where four high quality inks (cyan, magenta, yellow, and black) are combined to produce the final printed image. This process is used to print all colours and for more complex graphics or images. Screen printing is another option available. A screen is made from the backing material with a template of the graphic, colour is then applied by a roller. When the graphic is composed of more than one colour, the colours are applied one after another. Screen printing is recommended for high quantity printing due to the cost. With the graphic design service one of our designers will work in consultation with you to create an X-GLOO design that meets your needs perfectly, your design won’t go to print until you’re completely happy with it and have provided us with a final approval. Another service we offer is free 3D Visualisation, as seen in the image above. If you’d like to see how your X-GLOO inflatable tent may look before ordering, we can create a mock up in-house to your exact specification using our 3D design software. The mock up can include all the elements available such as walls, canopies and tunnels. If you’ve not got artwork yet we can pull logos and colour combinations from your website to brand the X-GLOO mock up with. We can also include various other components in the mock-up such as flags, cars, counters and people so you can get a feel for what your X-GLOO event tent may look like when fully set up and in use at your next exhibition. These service options are designed to support you before, during and after the purchase of your X-GLOO inflatable event tent. No need to worry if you’ve left your event planning to the last minute, we offer a range of in-stock options for the X-GLOO available on just a 2 week lead time. The in-stock X-GLOO event tents are available in a wide range of standard colours so we can still provide you with a tent for your event which is unique, eye-catching, and still carries the X-GLOO UK guarantee of quality. A select range of elements are also available for the in stock X-GLOOs including the entrance, window and standard wall, the canopy, canopy banner and the tunnel part. This allows you to create a bespoke X-GLOO event tent even at short notice. 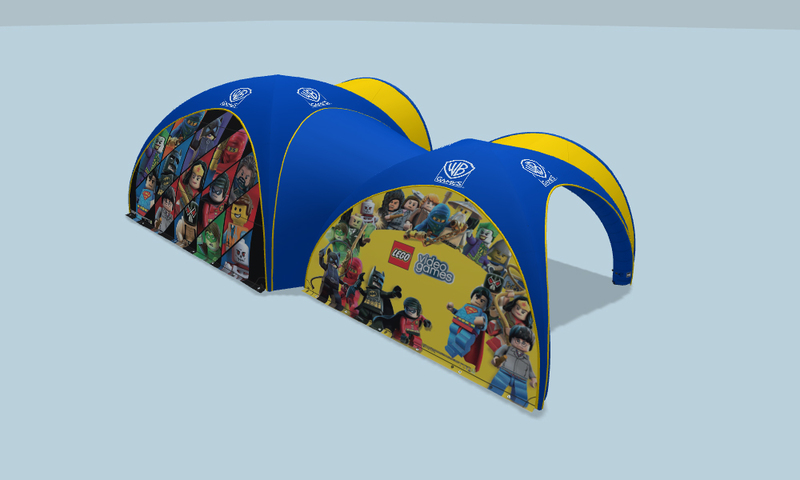 Please allow between 6-8 weeks for a fully branded and custom printed X-GLOO event tent. If you need an X-GLOO in a hurry, call us on 01733 511030 or contact us to find out how we can help. A range of accessories are available to complete your X-GLOO event tent and assist in the setup, anchoring and transportation. These include the Water Ballast Barrels and Tube Ballasts for hard ground anchoring and peg sets for soft ground anchoring. Wall Ballasts are also available which help to anchor the walls down during periods of strong winds. Covers are available for the water ballast barrels that are available fully printed so you can match the branding of the event tent for a more professional appearance. The hand pump comes as standard however if you’re looking for a quicker setup process the Electric Pump, Electric Turbo Pump and the 8x8 Pump are also available. To transport your X-GLOO efficiently whilst providing maximum protection, a range of cases and trolleys are available, including the XL Trolley, XXL Trolley and the Aluminium Box, depending on the size of the X-GLOO you are transporting. We also offer the Protection Foil which is ideal for use when setting your X-GLOO up outdoors as it is placed on the ground to protect the X-GLOO from mud, dirt and grass stains, allowing it to look its best for the event. Why Choose the X-GLOO Inflatable Event Tent? Easy to transport – backpack provided, trolleys or an aluminium box available separately. We are an official UK distributor of X-GLOO and we pride ourselves on providing high quality exhibition and display equipment. At XL Displays we offer award winning customer service - our customers are at the forefront of our work and we do everything we can to ensure they all have the same excellent experience when dealing with us. 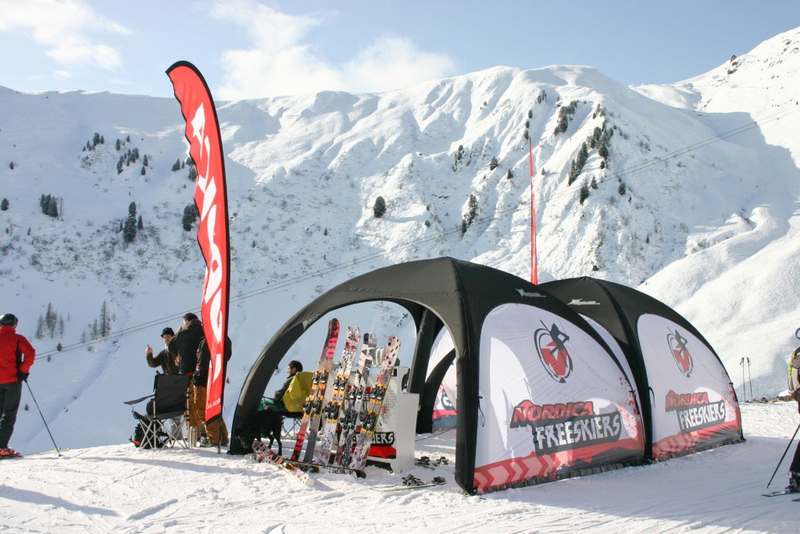 To find out more about our range of exciting X-GLOO UK Inflatable Tents, please contact us or call us on 01733 511030. Why Choose an Outdoor Flag?